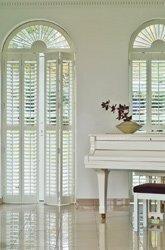 Creating stylish shutters for customers all over Ireland. New! Adare Shutters are ambassadors for RENSON outdoor shading solutions. Visit Renson Outdoor or call to our showrooms to see full range. At this stage I think I have come across every shape and size of window imaginable. Many years ago interior shutters were rare and business mainly consisted of repairing and restoring the solid shutters found in Georgian houses. While still popular in traditional homes, creations by Adareshutters can be found everywhere from modern homes and apartments to schools and offices. All our shutters carry a 10 year warranty. My showroom is open Monday to Friday 10am to 5pm. Saturday 11am to 4pm. We are located at 75 Eastlink Business Park, Tipperary Road, Limerick. V94N2WT (between EZ living and DFS). Alternatively call me on 086 1722593 and avail of our FREE nationwide home consultation service. Adare Shutters are not as simple to design and measure as curtains or blinds and really, unless you are a whiz at measuring and fitting, you are better off letting us do the whole installation for you. So, get an idea of price by calling us with your dimensions or click here for a quick quote. Then we will arrange to visit you. The survey has two purposes, firstly they must of course fit perfectly so need measuring accurately but secondly, there are many ways to place shutters and you will need to be present to discuss the various options with us. Do not order a survey if you cannot attend personally. We will be able to price accurately after measuring and you can place your order there and then. We accept a 25% deposit with the balance on fitting. We cannot survey openings accurately that are not finished, no plaster for instance, or tiling not done, window sills removed etc. Also, if you are putting shutters on doors and the new wood floor or carpet is coming next week, wait until after the floor is down. Shutters can be shortened after they are made but it is best not to. We will offer a DIY discount. It is possible to fit them yourself and many people do so very successfully. However, there are many pitfalls and it is only recommended for those of you with considerable DIY skills.